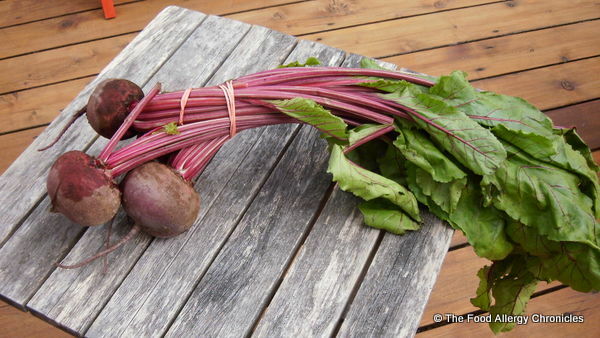 Posted on September 13, 2011 by Susan H.
Beets are at their best right now. I couldn’t resist this bunch at my local farm stand! 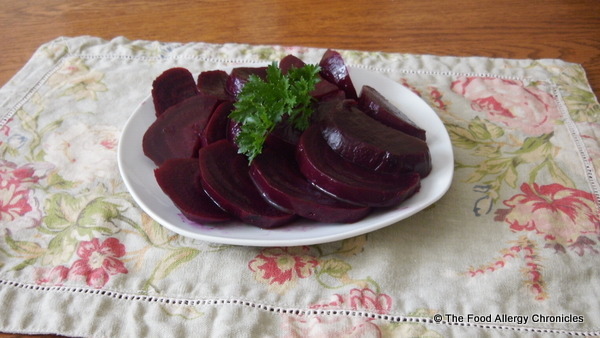 Roasting beets is so easy! I love to have them sliced and drizzled with extra-virgin olive oil or diced and tossed in a salad. 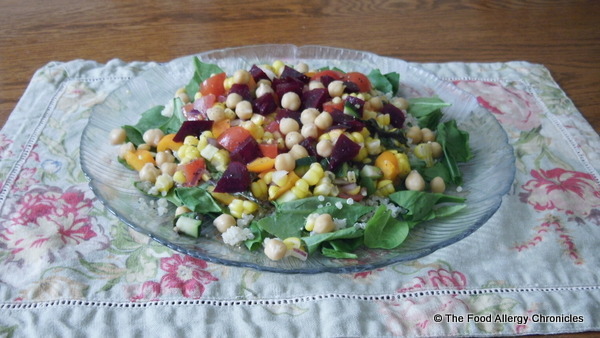 Great in my Summer Garden Corn Salad with the adddition of some spinach greens, chick peas and quinoa. I am often asked how I roast beets and “what do you do” with the beet greens? For all those interested, I have put together these recipes. Rinse beets to remove any dirt. Place in a sheet of foil and drizzle about 2 tbsp of olive oil over them. Seal foil around the beets. I then place them in a metal pie plate in case of leaks. Open foil and let beets cool. Slice off ends of beets and easily peel off the skin. Keep the beet greens! They are great sauteed as a side dish. A nice addition mixed with rice, quinoa or pasta. Full of healthy nutrients too! Snip off stems of the beat greens. Rinse under cold water and place on paper towel. 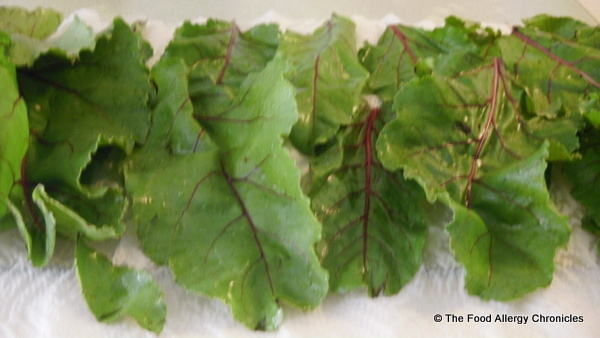 Roll up paper towel with beet greens and store in fridge until you are ready to use them. Heat a saute pan with a lid over medium heat. Add a tablespoon of canola oil. Saute a 1/4 cup of diced red onion, 1 clove of garlic minced and 1/4 tsp of red pepper flakes until onion is translucent. Add 1/4 tsp kosher salt and black pepper. Stir all ingredients together, cover and let steam for 5-10 minutes. Plate and drizzle with extra-virgin olive oil and top with some of the diced roasted beets. Tip: Try Swiss Chard, Kale or Spinach Greens. 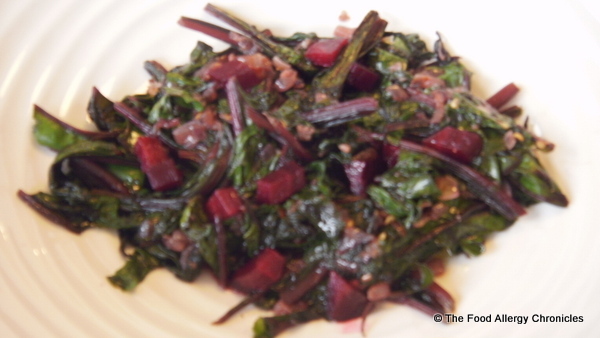 This entry was posted in dinner, vegetables and tagged roasted beets, sauteed beet greens by Susan H.. Bookmark the permalink. Hi Jane – Thank you for your comment! A little grated ginger is also another tasty addition. Enjoy!